Once again, we are back at summer and this one is special. This summer marks the 10th anniversary of the founding of CPR... It was the summer of 2005 that Sharon Gordon and I brought together a coalition of reggae industry practitioners to plan and stage the first Reggae Culture Salute to mark the 75th anniversary of the November 2nd, 1930 coronation of Emperor Haile Selassie I and Empress Mennen of Ethiopia, an event that would set in motion a sequence of events that include the emergence of the Rastafari Movement and ultimately reggae music. Reggae Culture Salute honors the unique relationship between reggae, Rasta, Emperor Selassie and Jamaica and the Coalition to Preserve Reggae Music strives to raise the bar in reggae music, elevate the profile of the purveyors of reggae and research, codify, curate and disseminate information about the reggae genre so as to increase understanding of its development, its significance, and its influence around the world. 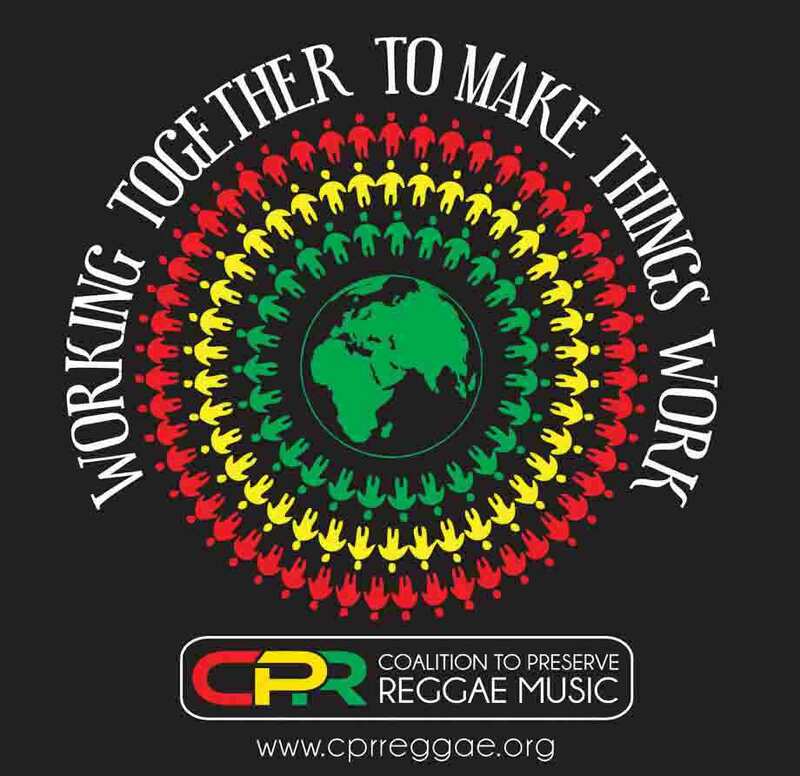 Today, CPR is a reggae lovers organization and as we advance into our second decade of existence, we continue to hold dear our motto and practice of working together to make things work and implore you to be a part of the next decade of preserving reggae music. This summer begins with the final forum of the seventh season of our Community Conversation Series, a groundbreaking series of forums that began in 2009 and has provided immense community education over the seven years, spawning several initiatives in the process. Join us on Thursday, June 25 for Who Mash Up Reggae - Part V when Christina Grand of Reggae Embassy will join us to explore education imperatives for the industry in a conversation titled, "What You Don't Know Could Hurt You" (see Who Mash Up reggae Part V below). On June 27th, CPR marks the 4th anniversary of CPRLive, the broadcast platform of CPR, with a memberthon broadcast to launch the 2015 Summer Memberthon campaign to garner membership support for CPR. The broadcast which begins at 3:00 PM on CPRLive provides an excellent opportunity to become thoroughly familiar with CPR, its programs and its plans for the future, and to pledge your support for making things work. Log on to www.cprreggae.org between 3:00 PM and midnight and be a part of the 2015 summer memberthon (see 2015 Summer Memberthon below). For the third year running, CPRLive will broadcast live from the International African Arts Festival. Make plans to visit the festival which takes place from 10:00AM to 9:00 PM each day from July 2 through July 5 rain or shine, but if you can't be there, CPRLive will broadcast from the main stage each day from 3:00 PM until 9:00 PM so you don't have to miss it all together. Be sure to stop by the broadcast booth and say hello when you visit the festival. We are located directly in front of the main stage on the grass. We look forward to you joining us in getting summer underway and to your steadfast participation in working together to make things work as we pave the way to another decade of preserving the soundtrack to the movement of Jah people. According to a report in the Sunday Gleaner of May 31, 2015, Patricia Chin, co-founder of VP Records, says the label is celebrating the revival of vinyl. The veteran producer, who started the label with her late husband Vincent Chin in 1979, and has pushed reggae and dancehall music in the international market for over three decades, says the label has already started to re-press old vinyl records. Ms Chin, who spoke with The Sunday Gleaner at the recently concluded Best of the Best festival in Miami, contends that vinyl is the heart of the music industry, and represents the true sound of music. "I feel happy and positive that they are bringing back the vinyl, because it was very popular 50 years ago, and it's like gold ... it never changes. You get the real sound like in the studio, if the vinyl is not the heart of the music, then I don't know what is," said Miss Pat, as she is affectionately known. At Best of the Best, VP Records erected its own museum as Miss Pat and her staff used the event as an avenue to promote Jamaican music, as well as raise awareness of the almost fairy tale journey of reggae and dancehall genres. Among the items on display were T-shirts, photos of iconic musicians, an old school cassette radio, a turntable, and of course, vinyl records. Miss Pat reportedly told The Sunday Gleaner that while the youth are attached to new technological developments, over time, they will grow to appreciate vinyl. "There will always be a fan-base for the vinyl, and the youth will catch up. The sound systems are there, and I am mostly happy to see when some persons from the new generation are pulling towards the collection of vinyls. The youth will want to connect with their past, because that is the only way they can know their future," she said. According to Miss Pat, the mathematics of cost will find a way to work itself out. "Fifty years ago, there were not many turntables, they were expensive and people found a way to get them, so we can do it from scratch. The factories are still in Jamaica, we just need to reopen them. Companies are there who have rights to music and were struggling because of the CD takeover. For VP Records, we have 50 years of music in our collection and we intend to start pressing even more," she said. She disclosed that the label had increased the pressing of vinyl records for Shabba Ranks and Yellow Man among others. "We have Channel One vinyl, Gussy Clarke vinyl, Penthouse vinyl, Prince Buster and so much more, but in the coming years, you will see more," she said. Writers, Songwriters, Poets and all other content creators, don’t miss this intellectual property forum when intellectual property (IP) attorney, Joshua Graubart will discuss the finer points of intellectual property, copyright, publishing and what you need to know about protecting your interest. --Bonus-- A special presentation about the Tsu social media platform where you earn royalties for all your posts of original content will also be provided. Not able to attend? CPRLive will stream the forum during the Real Talk timeslot, 7:00 PM - 10:00 PM. The Coalition to Preserve Reggae Music (CPR) an organization co-founded by Sharon Gordon & Carlyle McKetty made its mark in Reggae when it courageously celebrated its 10 Year Anniversary by staging International Women of Reggae, celebrating the feminine energy in reggae with a night of hits! The CPR team made the bold statement that an all female show can be successful by staging a grand event in the Walt Whitman Theater of the Brooklyn Center for the Performing Arts at Brooklyn College on Saturday, April 25, 2015. The concert headlined by VP Recording Artist Etana,billed as the leading lady of reggaealso featured hit maker and veteran Nadine Sutherland; Shuga, Jamaica’s new sensation; Dancehall veterans Lady Ann and Junie Ranks; Canada’s Tasha T, 2015 Juno Award nominee, and risings stars Chyna Nicole (New York) and Kristine Alicia (Florida). “This is what Bob Marley would want,” said Sharon Gordon in a recent interview conducted by Debra Lewis-Boothman. The Coalition to Preserve Reggae had rehearsal times set for each artist with a full band and backing vocalists. The band members were pleasant, professional and timely. Lenny (guitar and musical director), Carlyle McKetty (keys), Marvin (drums), Hoover (bass) and Ricky (keys) paid attention to each performer – no matter the success of the artist. At each rehearsal, which took place at a rehearsal studio in Brooklyn, backing vocalists Simone Gordon and Althea Layne-Hamilton did their part to ensure the integrity of the presentation. CPR welcomed artists with dinner, providing full dressing rooms, perfect professional sound and lighting, thoughtful backstage communications, escorts for the artist, bottle water and VIP area with exquisite hor’ d’oeuvres and a carpeted reception in fine style. CPR members and volunteers, including Andrea (Anmour) Holmes Seymour, Seba Damani Saunderson, Tyrone Roberts, Radio Rahim (original subject of Spike Lee’s “Do The Right Thing” movie) CJ Saunders and more dedicated members were hospitable to artists, families and attendees. Singer/Backing vocalist Simone Gordon warmed up the audience solo as Althea Layne-Hamilton (veteran backing vocalist) serenaded. Both Simone and Althea shared melodious voices backing all artists (except headliner Etana) for the evening. Yours truly, Chyna Nicole took audiences to the moon as they joined with me in singing my charted hit “Take Me to the Moon” “Love Me Forever cover” and more. Kristine Alicia powerfully sang “Freedom Fighters” as audience pumped their fists for freedom. She also sang love song “Will You Still Love Me,” a cover. Lady Ann delivered her hit “Informer” and had the audiences rocking and laughing to her humor and entertainment. Junie Ranks also brought audiences back to original dancehall with her “Big and Ready,” and mesmerized guitar player Lenny with her seductive sultry rub during her performance. Nadine Sutherland lit the entire Walt Whitman Theatre belting a string of hits including “Action,” “Wickie Dickie,” “Babyface,” “Walk Away from Love,” and more! She danced, enthusiastically sung and gave a brilliant and memorable performance. Tasha T delivered strong with “One Draw,” her charted hit “Bed of Fire”, and more bringing her cultural vibe to the stage! Shuga sang her hit songs “Ride di Riddim” and more ending her set with the inspirational “Ebony,” and received a standing ovation! Etana, the headliner,glamorously dressed in a black and white gown was gracious on stage and sang like a bird. She smiled and gave little excerpts, speaking to the audience before many songs, including “Stepping out of Babylon”, “Jamaican Woman,” “Richest Girl,” and more from her recent release “I Rise”. Etana has evolved beautifully dancing more and smiling during her performances. She rocked the audience and had them to their feet dancing. The Reggae star ended the concert with a finale, welcoming all of the performers to the stage to sing her United Nations pick ‘Better Tomorrow” from her junior (3RD) album, and invited Lady G, from the audience to come on stage and join the ladies. Lady G told the audience she was there to support the event as an audience member and not a performer, but when Etana gave her the microphone, it was pandemonium! She "tore the house down" with hits like Breeze Off” and more. The finale signaled a vision come to fruition and before it was over, Ms. Pat of VP Records and Ms. Gordon were on stage to congratulate all performers with floral arrangements and gift bags. “When is the next show on the tour?” an audience member asked. If you missed this historic event of an all female line up, be sure to contact CPR with requests. “Wouldn’t this have been more powerful had a full house turned out to support the women?” said Sharon during a discussion with a CPR member. On Saturday, April 25th, patrons traveled from near and far to join in a celebration of the feminine energy in reggae. The occasion was the recent staging of the International Women of Reggae (IWOR) at the Walt Whitman Theatre of the Brooklyn Center for the Performing Arts and before the night was over the event was hailed as a huge success. More than 72 hours later, the accolades continue to roll in. Here are but a few of the many messages CPR received via text message, email and telephone from patrons, performers and industry practitioners. DJ Face Money of 1st Class Flight heard on Randy's radio had a few things to say: "Ms Sharon Gordon, you plus the ladies created history in many ways ....you've all accomplished what most promoters are scared to death to even attempt. Looking forward to an annual event. Fly out!!" He also added, "The ladies were stunning in their outfits. They performed well, but most important for me was the genuine unity among them. It wasn't a poker face thing neither. Thanks Ms. Sharon Gordon and the flight attendants. Definitely 1st class settings." Social media commentator and CPR Selectress Mishibu Riddim Queen pointed out that, "Ms. G thing run so smoothly, that one can easily forget the enormity of the undertaking." Radio Host/Musician, Al Smith: The event was great, the energy was good, people did not want to leave. Congrats CPR. Many have called for IWOR to be an annual undertaking and with proper underwriting support, it very well might be. International Woment of Reggae L-R:Etana, Chyna Nicole, Junie Ranks, Lady Ann, Tasha T, Sharon Gordon, Shuga, Kristine Alicia and Nadine Sutherland. Editors Note: Besides being the selectress at the International Women of Reggae, dj Riddim Queen is a social media commentator and had more than a few things to say about the event. Her commentary about the event follows. At first I was a little nervous because I, personally, had a lot of last minute cancellations, many due to the Penn Relays, but as the hall started to fill up, I was reminded that most people don't know that you run a tight ship and will start when you say you will start; that will teach them to not come late to your events. Anyway, all of the performances were great, but I have never seen Lady Ann live and didn't know about her testimony…it seems she got knocked down and suffered some nerve damage, which is pronounced in her walking as she noted. Her performance was impeccable and she really left me wanting more. I really thought she was going to come back on stage… I guess it was just me wanting to see more of her. Junie Ranks did her thing. Nadine Sutherland was just like when I saw her 20 years ago at St. Mary's Beach Bash; My God, she is just a ball of energy. Her sound is just as it is on records and she worked every part of that stage. Tasha T did a remarkable job. Don't be fooled by her diminutive appearance, she has a big voice and knows who to use it. I watched her from the top of the auditorium and shed was gliding across the stage. I think the show stealer would have to be Shuga. I saw her at Mingles do a quick run through, but had never seen her do a full set. I must say, it was like two different people. This was a polished, confident performer who delivered every note with every fiber of her being. She had the audience in rapt attention. I could hear people commenting on her performance while she was on stage, "Yah man, she bad," "Ah who da girl deh, she wicked!" She knew she did something to that crowd and at one point she got a little emotional, when she told them it was her first time performing in Brooklyn. I don't think it will be her last. Kudos to the band, the CPR All Stars, the backing vocalists and the CPR team for stitching all of this together. It was a wonderful event, the sound was great. David Curtin, CPR member and archivist, said, he had never been inside the Whitman Theater before and was quite impressed with the acoustics. One woman who sat next to me said, "Next time don't keep it an any union hall." Ha ha ha! I guess she never read one back foot about the time! LOL! Brooklyn, N.Y., April 16, 2015... Brooklyn is getting ready for the convergence of resplendent songbirds set to take the stage at 8:00PM on April 25, 2015 for the staging of the highly anticipated International Woman of Reggae, #IWOR. Over the past two months, the Coalition to Preserve Reggae Music (CPR) has beenon a feminine centered campaign to educate, entertain and engage reggae lovers all over the globe. The multi-part initiative which has been sharing about the enumerable contributions women have made in reggae music comes to a head with a diverse array of artists converging on Whitman Theatre, Brooklyn College on April 25th for the #IWOR event. Headlining the #IWOR will be Etana who recently performed at the UN when her song "Better Tomorrow" was installed as the anthem for the international campaign to end ebola. Over the next two years, Etana will donate the proceeds from all downloads of the track to benefit children orphaned by Ebola. JC Lodge, widely known for the ‘80s mega hit Telephone Love will be there to remind that love can still be powerful and fun while former child prodigy and ‘90s sensation, Nadine Sutherland, responsible for hits like "Action" and “Anything for You” will be in the house reminding that more action and “not a bag o’ mouth” is what we need. The constellation of stars also include 2015 Juno nominee Tasha T from Toronto, Dancehall divas lady Ann and Junie Ranks, emerging artists Chyna Nicole and Kristine Alecia and, making her Brooklyn debut, the fast rising Shuga. From the month long celebration of women in reggae to mark Women's History Month, to the continuing CPR Songbird Challenge a social media challenge which implores reggae lovers to “whip out a phone and sing like a songbird” recording and posting 15-30 seconds of a favorite reggae song, CPR has engaged many, with Songbird videos flowing in from around the world via the web in support of CPR’s efforts to preserve and grow reggae music. All of the festivities have contributed to a steady build up of momentum and with less than 10 days to go before the #IWOR event, many are counting down the days. CPR a ten year veteran of reggae preservation has hosted many events in times past, beginning with the 2005 staging of the annual Reggae Culture Salute but the International Women of Reggae #IWOR event is the first of its kind for the organization, in celebration of the 10 year journey. Sponsors include VP Records and Dennis Shipping. Tickets to the event range from $30 to $60 with a special $100 VIP package that includes a post show meet and greet with the artists, refreshments, photo ops and more also available. Group discounts are available for choice seating but time is running out as the countdown continues.